In the complex choreography of conveyors and forklifts in a warehouse, or interaction between a sub-contractor and a carrier, simulation only can take into account the dynamic side of issues: blockages that occur in certain conditions only, a buffer of wrong size when working with a specific packing unit, all things for what a dynamic replica reveals more reliable than static calculations. Simulation for logistics must take into account multiple references and routes, bi-modal transportation, conflicting resources, customs routines and delays, out-dating stocks… Animation focuses on bottlenecks and stock alerts. The model studies a sea port where thousands of tons of various raw material for industry go through. The port can get blocked in reaction to unavailable spots on piers, storage limitations, etc. 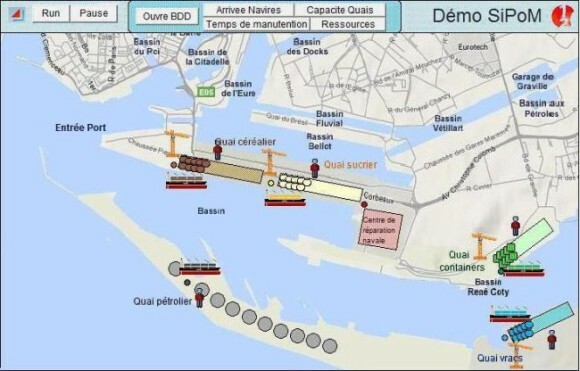 The aim is to test these constraints and vary the number of resources (ASR vehicles, dockers) and their shifts to manage saturation situations, while taking into account the timetables of tides.